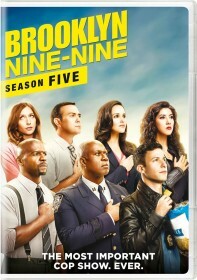 FOX has issued the press release for the April 8 episode of Brooklyn Nine-Nine, "The Puzzle Master". David Fumero (One Life to Live), who is of course married to Melissa Fumero, guest stars in the episode. Jake surprises Amy with an investigation into a string of arsons connected to her favorite crossword puzzle author, Vin Stermley (guest star David Fumero). Meanwhile, Gina helps Holt jazz up his Commissioner candidate speech, and Terry, Rosa, Hitchcock and Scully argue over who is most deserving of the new detective car in the all-new "The Puzzle Master" episode of BROOKLYN NINE-NINE airing Sunday, April 8 (8:30-9:00 PM ET/PT) on FOX. Jake surprises Amy with an investigation into a string of arsons connected to her favorite crossword puzzle author, Vin Stermley (guest star David Fumero). Meanwhile, Gina helps Holt jazz up his Commissioner candidate speech, and Terry, Rosa, Hitchcock and Scully argue over who is most deserving of the new detective car.